My Klepper foldable kayak, without the sail rig. 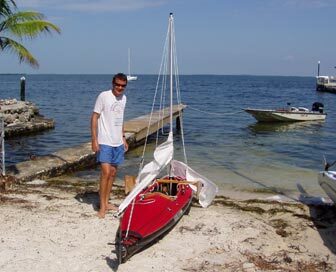 My Klepper foldable kayak, with the sail rigging attached. Finally, actually sailing the kayak. The Klepper Aerius Expedition foldable kayak has the sweetest feel when I paddle it. I bought a nice two piece wooden kayak paddle for it, which is lightweight and comfortable to hold. The wood frame of the kayak flexes slightly on waves, and the hypalon rubber and canvas skin bends a little. It's a smooth, dry ride. The boat has enormous carrying capacity, but when empty, it's a fast boat. 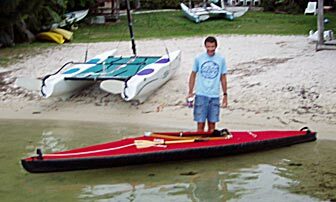 It is not quite as fast as my other fast kayaks, but will move easily at about 3 knots, and glides reasonably well. It's an extremely stable boat when paddling. You have to try in order to get it to flip over. With the sails up, it is a very unstable kayak. You have to pay attention to what you're doing, especially sailing upwind, or you will soon be swimming. 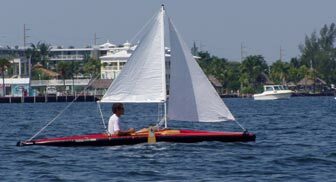 I try to sail it in relatively shallow waters, so that I can stand up if I flip it. If you capsize in deep water, it is difficult to right the boat and get all the water out of it. A small bilge pump is essential. The boat will sail upwind, but needs lots of energy to tack, and tacks through pretty wide angles. Perhaps in more experienced hands it can do better, but I have found about 110 degrees the best I can manage. It is helpful to backwind the jib a bit as the boat comes about, then snap it around to the other side. Off the wind, it's an easy kayak to sail. It reaches along comfortably and quickly, with no unbalanced feel to the rudder if the sails are properly trimmed. It can easily be knocked down by a gust, but if you are paying attention, it is also easy to ease off the sheets a bit as the gust hits. The boat likes to sail wing on wing downwind, and it is safe in most conditions to cleat off the sheets when doing so. Because of the directional stability of the kayak, you can retract the leeboards and the boat won't try to round up across the wind in gusts. It wants to go straight. Cleaning out the foldable kayak and putting it away is time consuming. Sand and salt get inside the hull skin, so I take the frame out and hang the skin by the ends to hose it out. Getting it dry is a long process, because the inflatable plastic tubes along each side provide many places for a little puddle of water to hide. I don't want to fold it up and put it in the canvas bag wet, so I'm careful to flip it over, towel it out, prop it open in the sun, etc., to get all the water out. The Klepper foldable is by far my favorite kayak, but because it is so time consuming to set it up and then break it down and clean and dry it, I seldom use it. It gets taken on trips, but rarely used in local waters. I took it with me on our recent cruise to Florida's Panhandle, and I took some very cool pictures during a dawn patrol paddle in a bayou near Apalachicola.